Recently we blogged about a local campaign using our Sound Crusier System to get their campaign message out. Candidate Robert Dold, himself a small business owner, and his campaign crew stopped by the Amplivox offices recently to show his support for small business. Check out the following Youtube video we made about his visit. Dold is running for the 10th Congressional District in Illinois and wanted to reach out to small businesses in the 10th district. 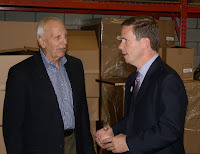 Dold toured the warehouse and answered questions regarding small business and how his campaign plans to work for small businesses if he is elected. At Amplivox we are proud to partner with community and government leaders to make sure their messages are heard clearly.